We have closed our print shop. Switched to offset in the early 1980’s, but hung on to most of the letterpress stuff. I have cleaned up lots of galley trays and sorted things. There’s a few hundred pounds of Lino lead. Also, have 6 cabinets of hand type - from 7 pt to 120 pt. I’m trying to find the complete type sets and might scrap the rest. Can anyone suggest a buyer for the metals and what kind of prices these metals go for per pound? The big fonts (72, 84, 90, 120 pt) would seem awfully costly to find a buyer and ship. List them on ebay. They are well worth the shipping cost. Skip eBay: I’m in Chicago and would be really interesting in Neuland or any other of the complete fonts. Thanks for the replies. I don’t really care to figure out the eBay gig. I will start gathering more and listing things here. I know I have that Neuland in a bigger and smaller size. Any thoughts on the Lino lead? I have about 400 lbs. of it. No spacers or hand type mixed in. Linotype alloy is sought after by bullet casters. I dunno what current spot price of scrap lead is, but it ain’t cheap these days. Talk to local gun clubs. Most of ‘em have a few old grey-beards who cast lead bullets and they would consider linotype to be a windfall. I only cast lead balls for muzzleloaders as that is what I mostly shoot. 400 pounds of lead would last me the rest of my life… but the empty milk jugs wouldn’t stand a chance! Shooting jugs is fun. I have some contacts at shooting clubs and bullet makers. Need to find out for sure what the scrap price is for the hand type and spacers. I’m been sorting thru lots and hope that selling full sets of fonts is the better way to go. Some of these fonts weight 36-50 lbs each. One thing that seems to be a concern about shipping is the ascenders and descenders on type. It seems like these could easily get damaged during shipping. I’ve been sorting thru lots of type. Many of the drawers had 2, and sometimes 3, fonts in them. (with obvious differences in sizes). Here are some of the sorted fonts, Lots of Baltotype. Well, no real luck on selling the lead for bullets. And that’s a good thing. I’m sure that some of it will end up getting melted, but I’ll keep looking for full or mostly full fonts. There’s a 5 pt Copperplate all the way up to a 120 pt Gothic. 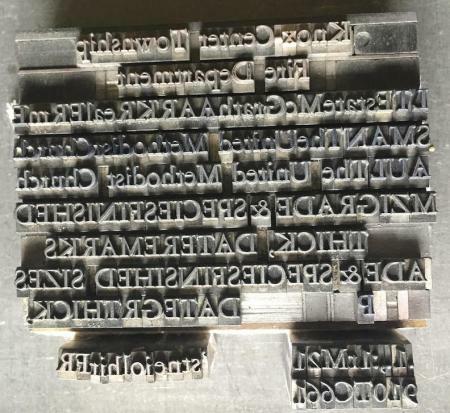 I have some fonts listed here on Briar Press and will continue sorting. I have a few different fonts that have 3 or 4 different sizes. Like a Park Ave in 36, 18, 14 and 12 pts. It be nice to keep them together. Anybody close enough that would be interested in the fonts as sets? Also, the big fonts and the fancy pants ones (Bank Scrip #1540) seem hard to ship. Thanks to Briar and the advice I’ve gotten from folks on here. For what it’s worth I have brought lots of lead scrap to a local metal scrap facility in NY. They have paid anywhere from a low of 30 cents to a high of 65 cents in the last 6 months. Browsing through sales on eBay some buyers have paid $1 or more per pound. Maybe try that route to see what you can get! Well, I haven’t scrapped any metal yet. Been sorting and selling lots of type - sold about 100 fonts so far - most were in pretty good shape, complete and full. Lot of work to font, pack and ship; better than melting it. Only have a coffee can so far of odd lead. Shipping lead for scrap doesn’t seem to make sense. Still have the 400 lbs of Linotype. Lots of our California Job Cases had 2 fonts in them; one had 4 in the same drawer. Most were in pretty good shape - didn’t have to smash the type on the 7 little Giants we had. Mostly just the small type left to font - 12 point and smaller. After fonting some of the Headline types and making space, was able to match up same typestyles that had multiple sizes (3, 4, 5 or 6). Sold a few sets of these; nice to be able to keep them together. One set weighed over 200 lbs for the 6 sizes. Still have 5 or 6 other typestyles in multi sizes - one is almost 250 lbs. Will be listing more type and things here on Briar soon. Sorting and cataloging these fonts is a tedious chore. Good morning, Do you have any Furniture or Reglet your selling? We do have 3 wood and 1 lead cabinets. Still using some of it for tying the type. And still need to sort some back into cabinets from the 20 chases that still had jobs locked up from the 1980s. Getting down to the bones on type. Found matches for most of the jobs that had been locked up for 40 years or more. Only filled a coffee can with odd hand type. Know of one or two of the almost 200 fonts that I’ve shipped that went to someone that sells the type as Names and Numbers. Had to cut that off. Have some bigger items still to get rid of - Galley Cabinets, California Job Cases, C&P, couple sets of 5 or 6 sizes of the same type style. 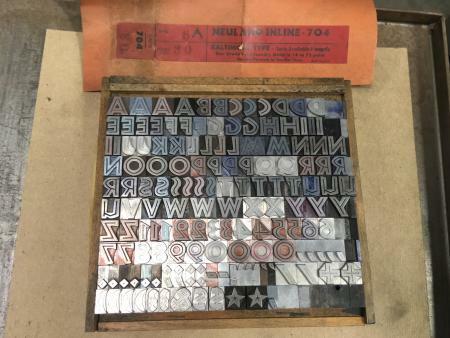 I just wanted to say thank you for taking the time to sort and sell your old type! I’ve only been doing this for a dozen years but already the number of times I’ve been in contact with a shop selling presses or stuff and had them say, oh we already scrapped all that old type, nobody wants that, is way too high. You are keeping the art alive and making many printers very happy!